We offer all general dental treatments, have a highly qualified team of dentists and stomatologists who speak english. We can also organize your local transport, accommodation and even entertainment between your dental treatment sessions. Here are just some of the dental treatments we offer - please see our website for further details. 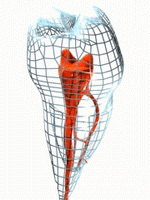 Implants are artificial replacements for lost tooth root. With their help, you can create a tooth or teeth, which aesthetically and functionally replace the original missing tooth. and this treatment is intended / viable for all patients. We have specialist implantologists within our team who have years of experience in dental implantology. Dental implants offer firm bonding with bone tissue thus allowing new solutions for patients lacking roots fit for other dental treatment. method of restoring the beauty aspect of a smile. This treatment consists of ceramic facets used as replacement of a thin layer of the tooth surface. and is based on trimming the outer layer of enamel of the tooth, and then applying - gluing the ceramic veneer. The ceramic veneer is prepared / made in kilns at high temperatures, and therefore at least two visits are needed. Teeth whitening is a cosmetic procedure during which the action of active substances is applied to teeth to obtain various levels of 'whiteness'. Teeth whitening or 'bleaching' is performed in one visit and takes about an hour after which you can evaluate the result. towards the loss of that tooth. The possibility of endodontic treatment - root canal treatment - allows us to significantly extend the life of a tooth. Basically the treatment consists of cleaning out the bad parts of the root canal, and then inserting a three-dimensional filling to prevent further transmission of the bacteria into the bone. Before the final filling of the root canal it is first necessary to exclude the presence of inflammation. bacterial infection often more than one visit is needed. He graduated in 2001 at the Medical Faculty in Olomouc. mikrostomatology and treatment of periodontitis. mainly in Great Britain and the USA. surgeries of DENTICS in Ostrava and in London. He is the author of many articles on aesthetic dentistry and microstomatology - published in professional journals in the Czech Republic and abroad. In these fields he also lectures in theoretical and practical courses for colleagues. Multidisciplinary cooperation in aesthetic dentistry. time with his wife and two sons. If there is any remaining free-time he enjoys sports, especially beach volleyball in which holds the title of world champion between doctors and health professionals.